When you visit a country, culinary is something you have to taste from that country. Culinary is also a form of community culture. So, through culinary you can know the culture that exists in that country. And culinary is something that is liked by everyone. Even they are willing to visit other countries for the sake of hunting the typical culinary and pride of the country. Without tasting the culinary places you visit, you definitely feel something is missing. As important as that is culinary when you go somewhere. Likewise when you visit one of the big cities of Russia, Nizhny Novgorod. You will find it easy to find delicious food there. Lots of restaurants, cafes and street vendors selling delicious Russian specialties. It’s no secret, Nizhny Novgorod is a city of art and history that has very delicious cuisine. Starting from heavy foods to delicious snacks in this city and very easy to get. Wine in this city is also very typical. Wine is something that is loved by the Russian population. drinking wine has become their habit because of the very cold weather in the country. But wine in this city is different. If you are curious you can immediately taste it in the fourth largest city in Russia. The first street food you have to try is Pryaniki. Prayniki is a typical Russian food that is very much sold on the roadside of the city of Nizhny Novgorod. In ancient times, Pryaniki was made to welcome guests. But now Pryaniki is a typical food and icon of Russia. Prayniki is a gingerbread cookie made from a combination of honey, brown sugar, and spicy ginger spices. Cookies filled with delicious plum jam. This cookie taste is very unique, because of the combination of sweetness from sugar and honey and the spicy taste of ginger spices. This cake is perfect for eating in winter at night with tea or Russian coffee while enjoying the lively and beautiful city of Nizhny Novgorod. If you are interested you can get it on the edge of Bolshaya Pokrovskaya Street. Sometimes we are tired of just ordering food, then sitting in a restaurant or eating fast food. With the many street food sellers, we get something new. When you visit Nizhny Novgorod, the street food you have to try is Shaurma. That’s how the Russian population called the name of street food. Shaurma is food originating from the Arab world or the Middle East with the original name Shawarma. Shaurma is a meat dish that uses lamb, chicken, turkey, beef, buffalo or other meat which is put on a long iron and baked all day by rotating in front of the fire. Then, the cooked meat is wrapped in a tortilla with vegetables, sausages, mayonnaise, and sauce. Street food is really delicious! They usually also sell soda cans in the refrigerator next to their kiosks. you can enjoy Shaurma with the soft drink. Most of the people who sell Shaurma are natives of the Middle East and they are very friendly to their customers. Usually they always ask where the customer came from. 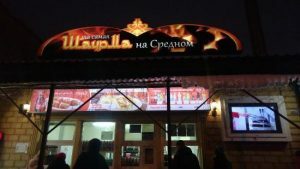 You can eat Shaurma on the roadside bench they have provided or while walking around Nizhny Novgorod. If you are interested, you have to pay 100 rubles or around 3 dollars. So cheap, right? You can buy Street food at Sladky Gorky. It is a Russian coffee and tea stall located on Bolshaya Pokrovskaya Street 57 and is 0.8 miles from the Kremlin. Bolshaya Pokrovskaya Street is indeed a place for hunting street food. And Saldkiy Gorky is a kiosk that sells street food in the form of diverse Russian coffee and tea. They also sell typical Russian and European food. The most famous menu of this place is bitter sweet coffee. Lots of customers have fallen in love since they first drank this coffee. During winter, their coffee and hot tea will feel very good and make you warm. A very friendly barista and smile will always make you feel warmer. You can enjoy this coffee while strolling on Bolshaya Pokrovskaya Street enjoying the beauty of the night of Nizhny Novgorod and the crowd of visitors. If you are interested, you have to pay 206 rubles per cup. Or around 3 dollars. You certainly know Burrito, a very famous Mexican specialty. Burritos are minced beef or pork wrapped in whole wheat tortillas. The Burrito is almost the same as Shaurma. But the taste of meat is different because it uses different recipes. In Nizhny Novgorod, you not only can taste typical Russian food, but also street food from other countries. Like Burrito from Mexico and Shaurma from the Middle East. If you want to taste authentic Mexican Burritos, you can get them at the Burrito Family kiosk at Malaya Pokrovskaya Street 4. They are open from 12 PM to 10 PM. The price of this burrito is also affordable, only 206 rubles or around 3 dollars. For this Burrito flavor, you don’t need to doubt it. It feels really delicious! Adventure hunting street food is indeed a very exciting experience. We can feel the hustle and bustle of the city that is challenging, complete with sellers’ yells, food smells, or cooking attractions. A uniqueness that is very unfortunate if we miss. Especially if we visit a city that has good street food. When you visit Nizhny Novgorod, there are many street food that you can try. And among them are 4 street foods that we mentioned above. You will not be disappointed when visiting Nizhny Novgorod. Not only are your eyes satisfied with beautiful scenery, but also your stomach is satisfied with delicious street foods. Those are the street foods you can try when you visit Nizhny Novgorod. Street foods are very easy to find, and most are sold around Bolshaya Pokrovskaya Street. Happy trying!